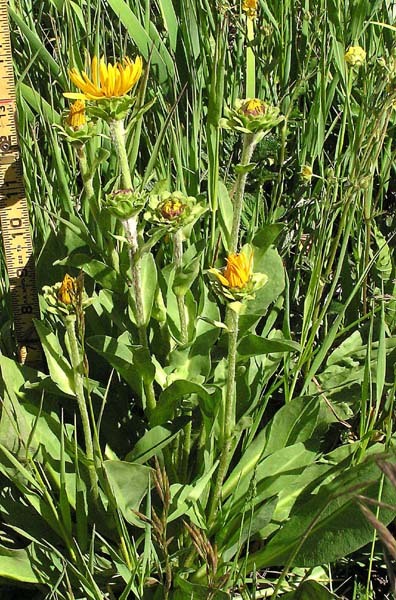 Pyrrocoma crocea looks, at first glance, as if it is a cross between a Wyethia (long, broad, upright basal leaves; very large flower head) and Dugaldia hoopesii (prominent light-colored leaf mid-vein; long, upright flower stem; large golden yellow flowers with narrow rays). It isn't a blend of the two but since it even shares some of their habitats, misidentification is easy. The large, rounded, overlapping, cabbage-like phyllaries are a key identifying factor. Plants can grow to three feet tall in montane meadow and may be growing in the same area as Dugaldia hoopesii. "Pyrrocoma" is Greek for "tawny mane" and refers to the pappus color. "Crocea", from the Greek for "Crocus", refers to the saffron/orange color of the flower. Charles Parry collected the first specimens of this plant for science and Asa Gray named it Haplopappus croceus. Edwin Greene named it Pyrrocoma crocea in 1894.